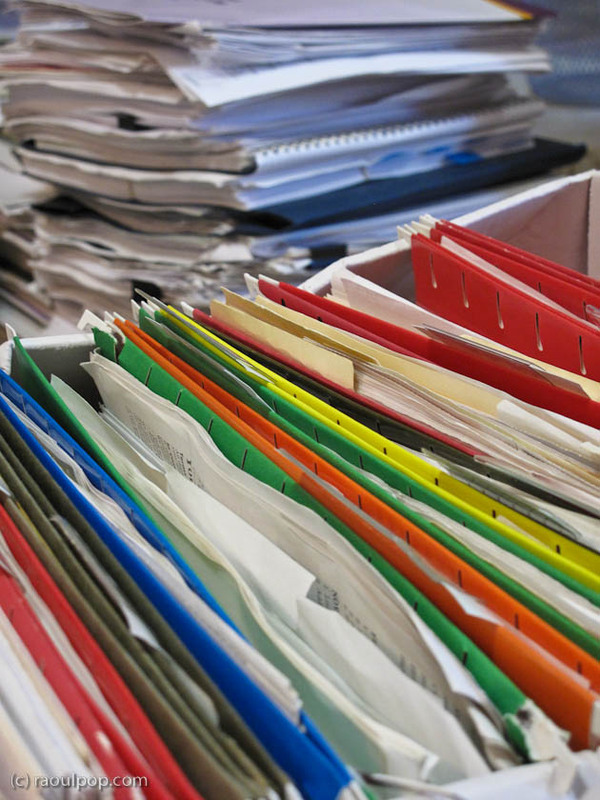 You can get buried in paperwork in this modern, electronic, paperless society of ours. Bank statements, tax records, property tax statements, mortgage statements, credit card statements, store receipts, business expenses, insurance records, car records, the receipt for last Tuesday’s gadget purchase that you have to keep for two years because you also got an extended care plan, the restaurant receipt from last August’s meal with a client that you have to keep for the IRS since you’re deducting it from your taxes, etc., ad nauseam. Can’t we have it simpler? Can’t it all be truly electronic? Can’t everyone just send us email receipts and statements instead of giving us paper ones? I like the way the Apple store does it. You buy something, you have the option of getting an email receipt. They have these neat credit card swipe machines they carry with them (they’re wireless), they check you out where you are in the store, and you get an instant receipt listing your purchase. It’s beautiful! Why can’t restaurants do this too? Why can’t the vehicle emissions and inspection stations do this? Why can’t all stores do this? Why can’t all banks and credit card companies handle everything electronically? My bank (USAA) has been doing it for years, and it works beautifully. Why can’t city and county governments do this? Why can’t mortgage companies do this? On a larger and more important scale, why don’t hospitals and insurance companies handle EVERYTHING electronically, without any paper of any sort? If you’re a doctor and you have to file claims, you know what I’m talking about. If you don’t, then your secretary or claims specialist does… You have paper records for everything. Everyone has electronic systems, but very few talk to each other, and paper is still the only way to transfer information. This is pathetic. Hospital information systems ought to be able to send an electronic record of a patient consultation filed by a doctor to that doctor’s medical records system, which in turn ought to be able to process that information and send it to insurance companies electronically, who in turn ought to be able to process that claim and send an electronic notification to the doctor’s medical records system to update the claim status, then issue an electronic funds transfer to that doctor’s bank account. There should be no paper involved whatsoever, but those of us who deal with this stuff know it’s a far cry from it. If there’s overpopulation, and we’ve got dwindling resources, and forests are being cut down at alarming rates all over the world, why do we have this constant avalanche of paper rolling toward us every month of the year, burying us under? If you’ve got multiple credit cards and bank accounts, a mortgage, a couple of cars, and a business on the side — and it’s your misfortune that the business is a medical one — you’re likely suffocating under paperwork. It’s nuts. Next Post A 27 GB hard drive for $276? I agree. I think it’s an absurd that in the era of technology we still get receipts in restaurants and markets. How many trees have ben chopped down just to cover this when, in fact, it all can be handled digitally. And I’m even including vote here. Some have it digitally, others still have it done on papers. Don’t understand why.